This summer salad is a hit at every gathering. It’s one of my most requested recipes. 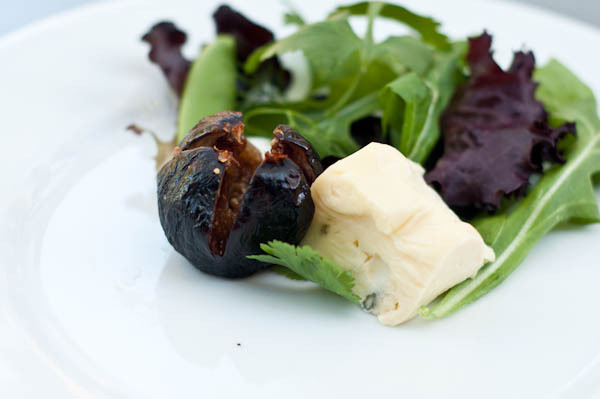 Slightly tangy vinaigrette truly compliments the sweetness of the caramelized figs. Cut a small “X” in the top of the figs and squeeze it gently to crown it slightly. Put the figs on a sheet pan and drizzle them with olive oil. Bake until the figs are soft and caramelized, about 15 minutes. Put the mixed greens and chopped herbs in a bowl, drizzle with a little olive oil and season with salt and pepper; toss gently with your hands. 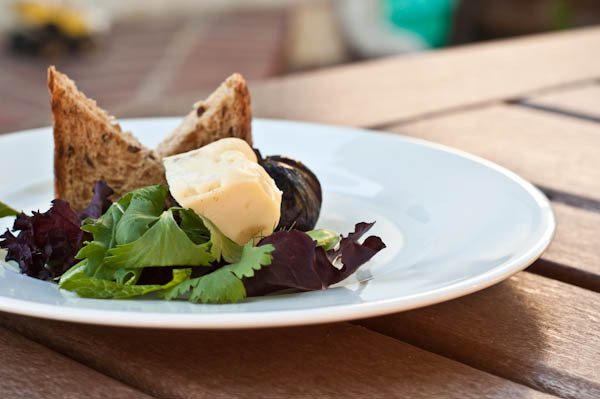 To serve, divide the greens between 2 plates, mound the chunks of gorgonzola cheese on the side of each and place 2 roasted figs in the center of the salad. Drizzle the whole thing with the warm honey vinaigrette. I’ve never had fresh figs, only dried one, I wonder how they taste. I love figs. Those looks great. Oh, if you have never had a fresh fig before, you are in for a treat! They taste like a mix of peaches and strawberries! They are lusciously sweet with a texture that combines the chewiness of their flesh, the smoothness of their skin, and the crunchiness of their seeds. And when baked, the sugar caramelizes and the fruit softens! Figs are in season now – try them! A friend of ours has a fig tree filled with almost ready figs, I can’t wait! I have never tried to caramelize them, but I will now, thanks for the inspiration! I make this salad too, except I then go crazy and throw in walnuts carmelized in butter and brown sugar. People DIE for this salad, and it’s a great way to use up all the figs on my tree. Great photo! Thanks, Jenn. Sometimes I add toasted almonds. We cannot do walnuts (allergies) but they would be a great addition to the salad!